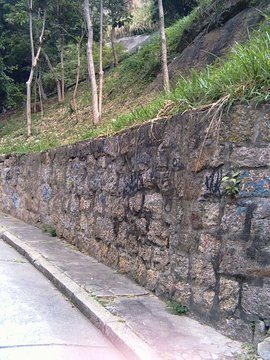 A retaining wall may be purely decorative or it can be used for reinforcement/to prevent soil erosion. Retaining walls can be made of concrete, interlocking blocks, stones, wood, and various other materials. Retaining walls made of interlocking concrete blocks are usually the most economical option at $15 to $30 per sq. ft. Wood walls generally run $20 to $25 per sq. ft. Stone retaining walls cost approximately $25 to $40 per sq. ft. Poured concrete usually averages between $30 and $40 per sq. ft.